Looks like you are currently in United States but have requested a page in the Italy site. Would you like to change to the Italy site? The analysis of steel structures is complex—much more so than the analysis of similar concrete structures. There are no universally accepted rules for the analysis of connections in steel structures or the analysis of the stresses transferred from one connection to another. 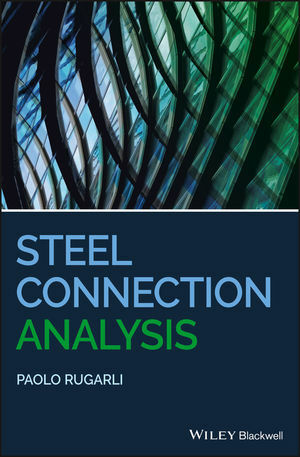 This book presents a general approach to steel connection analysis and check, which is the result of independent research that began more than fifteen years ago. It discusses the problems of connection analysis and describes a generally applicable methodology, based on Finite Element Analysis, for analyzing the connections in steel structures. That methodology has been implemented in software successfully, providing a fast, automatic, and flexible route to the design and analysis of the connections in steel structures. Steel Connection Analysis explains several general methods which have been researched and programmed during many years, and that can be used to tackle the problem of connection analysis in a very general way, with a limited and automated computational effort. It also covers several problems related to steel connection analysis automation. Structural engineers, fabricators, software developing firms, university researchers, and advanced students of civil and structural engineering will all benefit from Steel Connection Analysis. PAOLO RUGARLI is a structural engineer and the principal of Castalia S.r.l., a software developer and structural engineering consultancy founded in 1991. He has developed, among others, the Sargon and CSE software packages, both of which have been used in the commercial design and analysis of steel structures for many years He also wrote several books related to structural engineering, finite element analysis and validation of software structural models.